Google’s up to something. Of course, Google’s always up to something, but reports over the weekend suggesting the company is behind a mysterious construction atop a huge barge in San Francisco Bay have left many wondering precisely what the Web giant has up its sleeve this time around. While some reports suggest Google is building a huge data center designed to harness wave power, others claim the structure (below) is set to become a floating store for Google’s AR Glass specs, which are likely to launch next year. The four-story windowless structure, which appears to be made from a large number of shipping containers, is currently floating on a barge moored to Treasure Island. San Francisco CBS affiliate KPIX 5 reported that although the Mountain View company has said nothing about the structure, sources close to the project said it’s set to become “a floating marketing center, a kind of giant Apple store, if you will — but for Google Glass”, and that once building is complete it’ll be anchored a short distance away at Fort Mason and opened to shoppers. 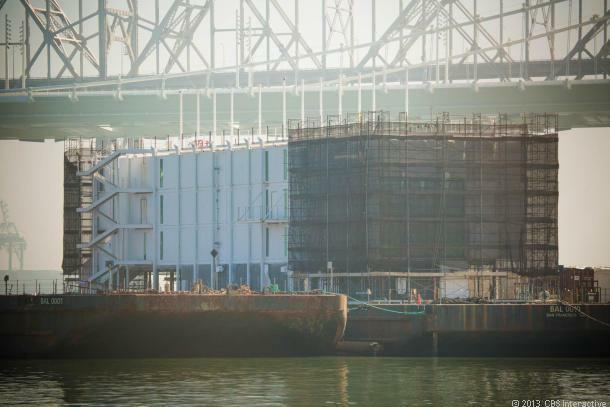 In another twist, work on the mysterious facility suddenly stopped a few weeks ago, with KPIX 5’s source claiming Google is having trouble obtaining a permit to operate its floating whatever-it-is. An official working for the San Francisco Bay Conservation and Development Commission said that part of the problem is that the company hasn’t been clear enough about the purpose of the structure, and until it explains what exactly is going on, a permit is unlikely to be granted. A Cnet report, meanwhile, suggests Google is building a data center that’ll use waves for energy and water to cool its servers. The report mentions a similar structure that arrived in a harbor in Portland, Maine earlier this month, and claims the same company, By and Large, operates both barges. Significantly, Cnet says it has identified a person linked to both By and Large and Google, and points out that the Web company has a patent for such a “water-based data center” that was granted four years ago. If Google does have anything to do with these mysterious floating buildings, it’s choosing to keep quiet for the time being, though with the images suggesting they’re in the advanced stages of construction, perhaps all will be revealed soon.